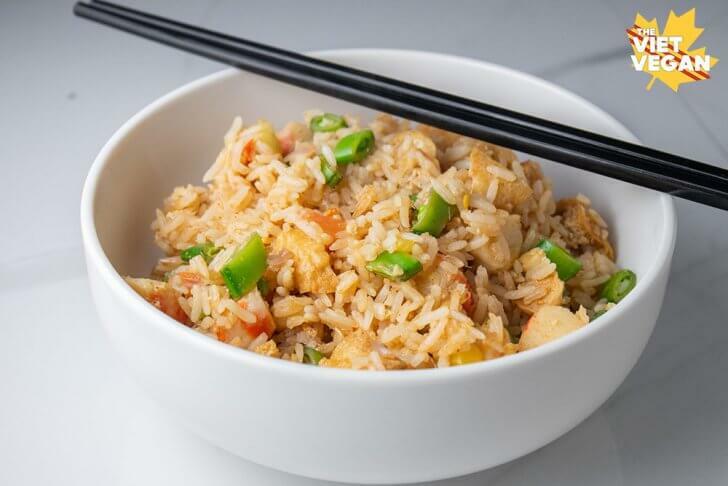 One of my favourite dishes at our local veg-friendly Chinese restaurant is a vegan tom yum fried rice with tons of fresh pineapple, soy ham, tomato, and lemongrass-y goodness. I’ve been procrastinating veganizing it to enjoy at home but thanks to USA Rice, you guys have it sooner than later! Most of the flavour of this dish comes from the vegan tom yum paste, which is traditionally not vegan. There is usually fish sauce and shrimp paste in it, which delivers a salty, umami flavour with a bit of funk. To veganize it, I used tamarind to take advantage of that sweet and sour flavour of tom yum, and dried mushroom to replicate that deep, umami funk. 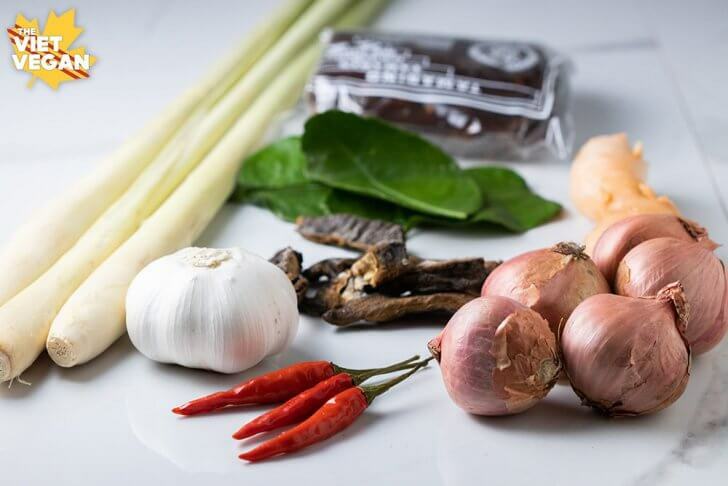 This recipe makes a lot of vegan tom yum paste, but I’ve been using it for soups, stir fry, and seasoning tofu so it can be used for many different dishes! 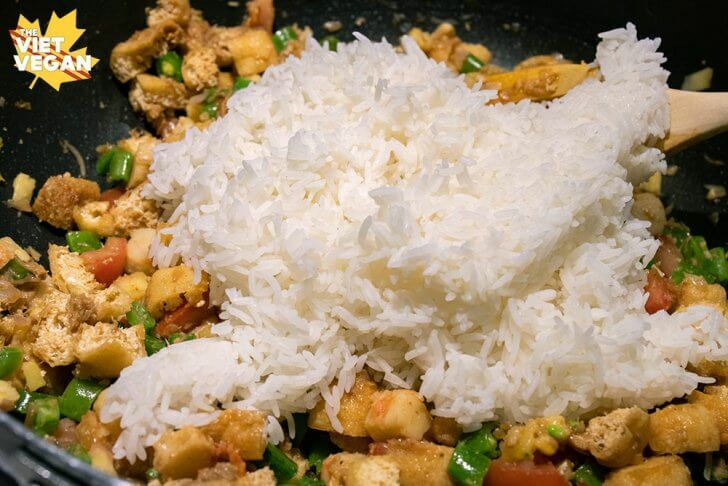 However, if you’re going to make fried rice, I recommend using day-old or slightly dried rice (you can even cook it fresh and use a little less water than you usually would), because as you stir fry veggies and everything together, you want the rice to be able to absorb the moisture and flavours of the dish. Many of you know that I try to live my life as ethically and sustainably as possible, so I try to eat foods that are grown closer to home. Since Canada doesn’t have the correct climate for growing rice, the US is the closest place that grows rice. Eating food grown closer to home means less transportation required and emissions. I also learned that the amount of water needed for rice fields is actually really beneficial for local fauna (especially ducks) since they need more wetlands. I love that these rice farmers provide wetland habitat for the wildlife there as well as growing rice! 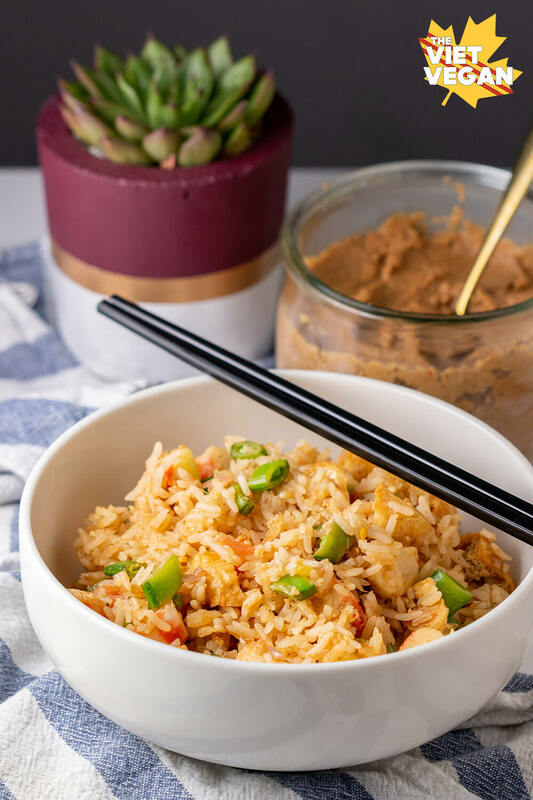 If you want to learn more about USA Rice growers, where they grow, and more recipe ideas, check out their website! In a high speed blender, combine the finely chopped lemongrass, shallots, garlic, sliced galangal, kaffir lime leaves, tamarind/mushroom liquid, Thai chilis, reconstituted shiitake, vegetable oil, coconut sugar and mushroom broth powder (or replace with kosher salt if you don’t have mushroom both powder). Blend until everything is evenly blended. 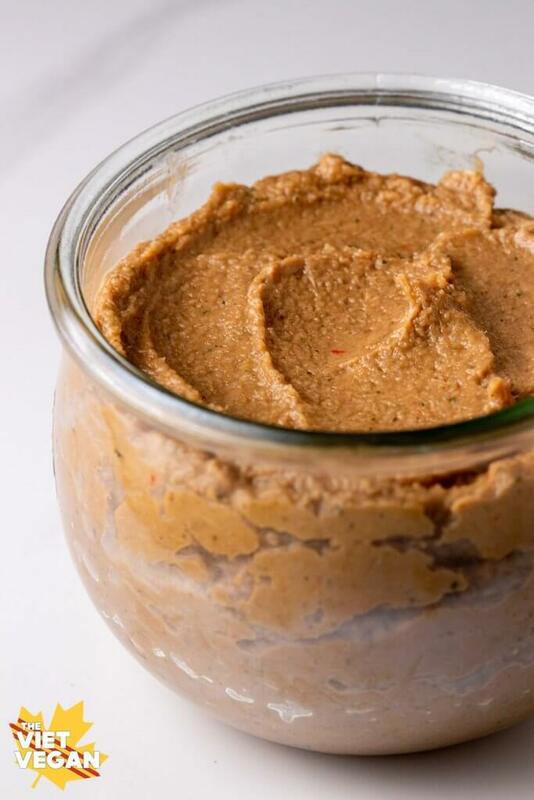 Transfer to a clean jar and set aside. In a large wok/skillet, heat vegetable oil over medium for 1-2 minutes, then add shallots and cook until lightly browned, stirring occasionally. Add garlic and fry until fragrant (about 2 minutes). Add 1/3 cup tom yum paste and stir to cook the spices, about 2-3 minutes. 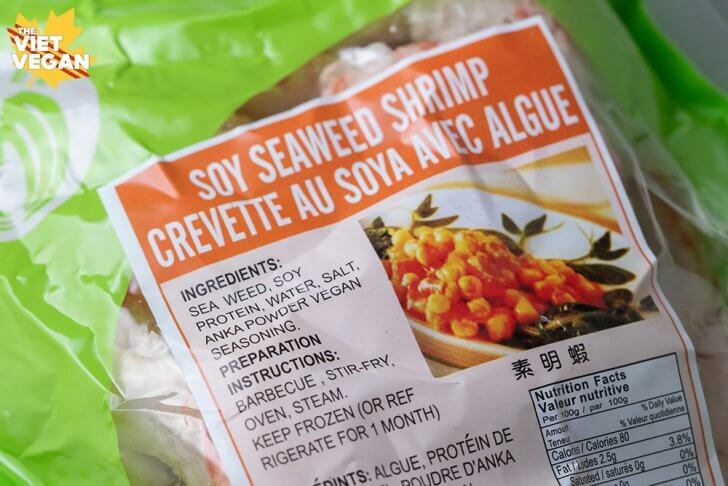 Add the chopped vegan shrimp and stir to cook, about 2-3 minutes. Add the puffy fried tofu and heat through. Add the snap peas, pineapple, and tomato and stir to coat again, cooking until snap peas are bright green and tender-crisp (about 2-3 minutes). Add 1 tbsp mushroom broth powder and stir to cook. (You can substitute concentrated bouillon or salt, but mushroom broth powder adds a lot of flavour). 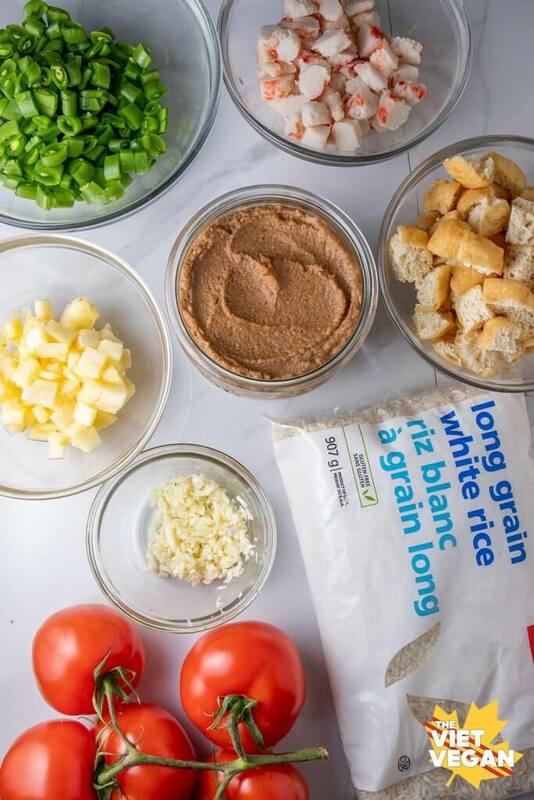 Add the cooked USA-grown long grain white rice and add tamari, stirring well to coat the rice in seasoning and stir in the vegetables. Taste and add more tamari or tom yum paste if desired. 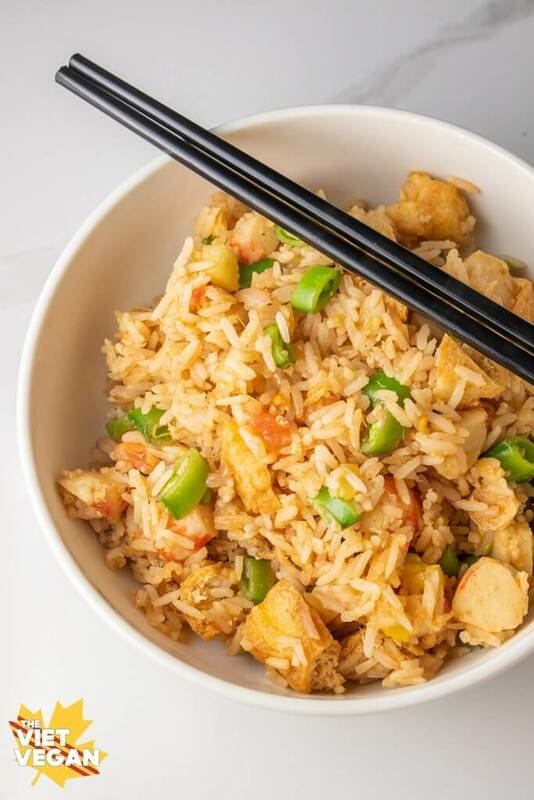 Wow, this looks so yum, I need to add this to my list of recipes to make, I absolutely love fried rice. This looks delicious.On another note, I was reading an article that not all produce that is grown locally is more environmentally friendly. For example, tomatoes grown in Canada in greenhouses produce more carbon dioxide than the tomatoes that are grown in a warmer climate and transported to Canada. Although, I don't see this applying to rice but it is difficult to find various varieties of rice that are grown close to home.